The California Coastal commission recently posted the winners of their annual Coastal Art & Poetry Contest. We post a lot of serious issues here on the blog and sometimes the perspective of a child says a lot more than a conservationist, scientist or politician can convey on a subject. 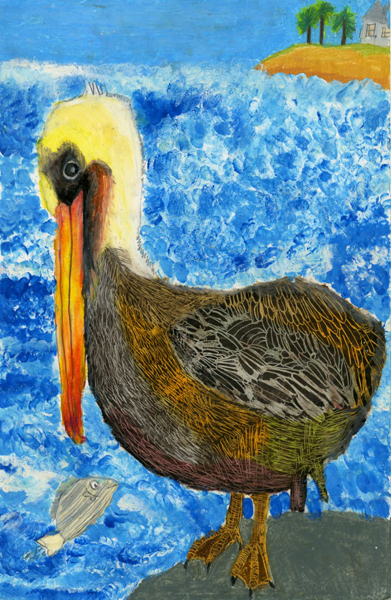 It is amazing to think that this pelican drawing was done by a first grade student! One of the winning entries was a poem from Isaac Goldstein, an 8th Grade student from Ventura CA, talking about our California sea otters and the removal of the “No-Otter” Zone. But otters were stalked where they dwelt. Hunted for their lustrous pelt. Then told to move to San Nicolas. Giving otters directions is ridiculous. But now otters have protection. Keeping them from their historic home. Which kept the kelp from staying alive. When roots are eaten, the kelp is gone. They lost their nurseries just like that. Letting spawning fish be unafraid. Otters can now roam an 840 mile coast. Otter skins no longer can hunters boast. Otter relocation will no longer stand. No longer from waters are otters banned. This entry was posted in Kid Art, Uncategorized and tagged "No-Otter" Zone, poem, sea otter art. Bookmark the permalink. Amazing art – both the drawing and the poetry! Kudos to the winning students and to the Sea Otter Scoop for publishing it! Yes, it was a cool project!